Having a younger sibling comes with a ton of perks. You always have someone to talk to, someone to boss around, and someone who will always have your back when things get scary. But being adored by a little one has one small drawback. You’re the center of their world, which can make getting alone time impossible! The gorgeous Husky in this video knows exactly what we’re talking about. He’s just trying to eat his lunch in peace, but his little Siamese kitten bro just won’t leave him alone! It’s pretty obvious that this is a daily occurrence by how chill and unbothered he is about the whole thing. Older siblings of every species should certainly follow his example. 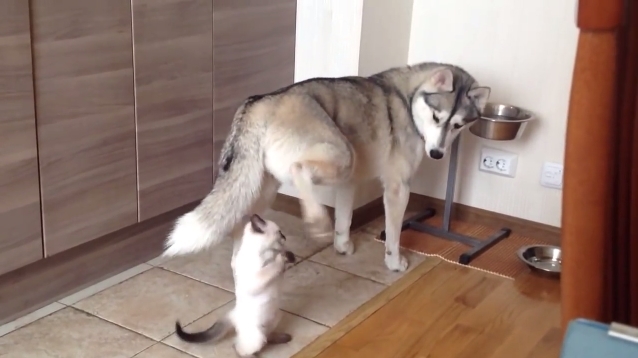 We’re certain that there were hours of Husky on kitten playtime after this video was recorded. Then the Husky probably ended up in a situation like this dog who found himself in the midst of a kitten snooze pile. What can we say, being an older brother is a demanding job! Responses to "Tiny Kitten Refuses to Leave Husky Sibling’s Side … Literally"